Dr. Cornelia De Moor from the University of Nottingham's School of Pharmacy led the study and said: "The natural compound cordycepin is derived from a caterpillar fungus which is famous in the Far East for its medicinal properties. In this paper we show that orally administrated cordycepin reduces pain and halts disease progression in animal models of osteoarthritis. Intriguingly, it does this by a different mechanism than any other known anti-inflammatory painkiller, through affecting the last step of making a messenger RNA, polyadenylation. This means that medicines derived from cordycepin may help patients for whom other treatments have failed. We hope that cordycepin will prove to be the founder of a new class of pain killer, the polyadenylation inhibitors. There is a long way to go before a cordycepin derived medicine reaches patients, but our work is very promising we are very excited about the prospects." Osteoarthritis (OA) is a common chronic age-related joint disease, with approximately a third of people over the age of 45 seeking treatment for the disease. 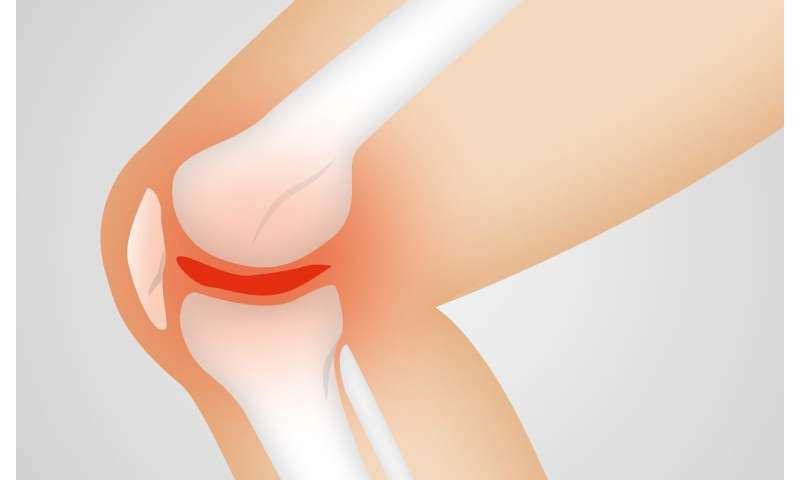 In osteoarthritis, the cartilage becomes flaky and rough and small pieces break off to form loose bodies in the fluid that lubricates the joint called synovial fluid. This causes irritation and inflammation of the synovial membrane. The loss of cartilage leaves bones unprotected and vulnerable to damage. The results from this new research provides the possibility of a more effective treatment for osteoarthritis suffers that is less toxic, so will have reduced side effects for patients. Dr. Stephen Simpson from Versus Arthritis said: "Persistent pain is life changing for people with arthritis. This is not good enough and so we are delighted to support this research that has led to these fascinating findings. Previous work by this group has shown this compound has anti-inflammatory effects and in the latest studies support understanding of how this works on cells responsible for inflammation. Although in its early stages, the study has great potential for helping people suffering pain of musculoskeletal conditions and demonstrates the high value and impact of novel discovery-led research on understanding and treating diseases." Might the benefit of cordyceps be rooted in the effect of negating a fungal infection at the cause of the joint deterioration ? ?